Today was a special day for me. 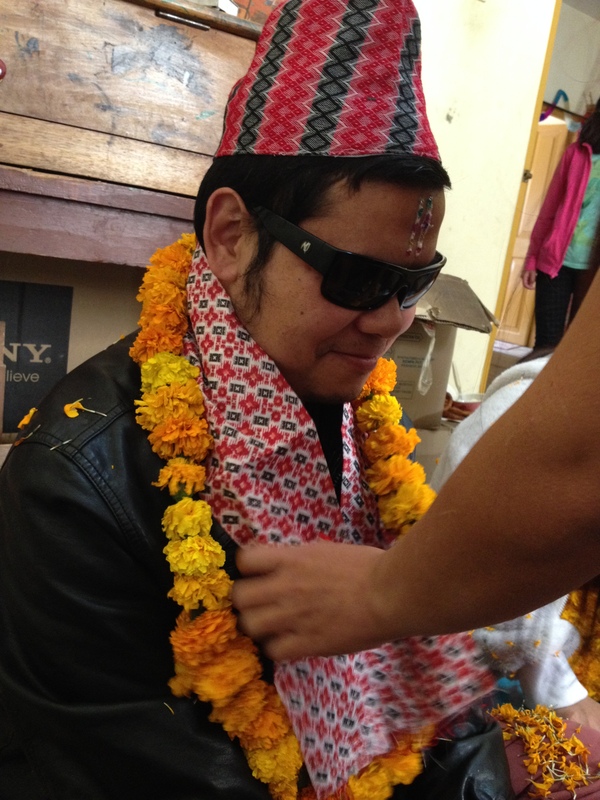 I got the opportunity to receive Tika (a symbol of blessing) from my own cousin sisters for the first time in my life. Although we grew up together, we had never celebrated such festivals as Diwali or Dashain together because they were brought up in an orthodox Christian family. On my side, I have no biological siblings and hence, I had never got a chance to receive Tika from my own family-members since as long as I can remember. Only a few days back, I came to know that my cousin sister (my paternal uncle’s eldest daughter) who is married to a Buddhist celebrates Hindu festivals and I immediately decided to go to her place to receive Tika on this special occasion. It is still secret to her parents though. This morning, I and my wife first woke up at 05:00 to receive a group of people who had come to play Deusi-Bhailo: an age-old Hindu tradition of caroling. 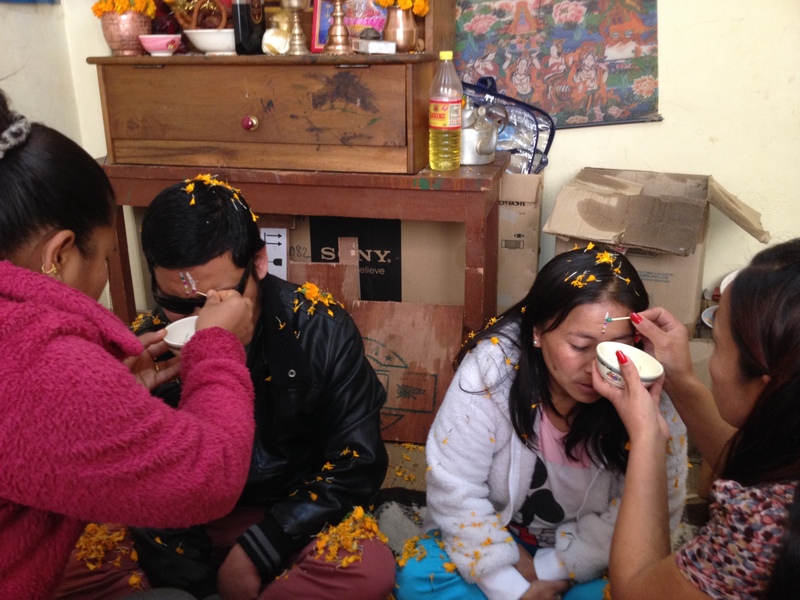 Then after the morning rituals, my wife blessed her brother with Tika and we all headed to my cousin sister’s house in Kala Bazaar. We were soon joined by my younger cousin sister who is still a Christian but she did not mind celebrating the festival with us. It was a special moment for all of us, a happy family re-union which hardly occurs today in the midst of busy daily hassles. The most important thing was the cultural orientation for our kids. Today is an auspicious day on which brothers receive blessings and good wishes from their sisters so, my cousin sisters’ daughters first blessed my sons with Tika and that gave them the opportunity to get some ideas about the cultural and traditional values we have inherited from our ancestors. They were explained the significance of each procedure as they gave and received blessings as advised. All the kids were equally excited to receive gifts and money as a gesture of love and wishes. After the kids finished their turns, I and my wife received Tika from my cousin sisters. The flower garland they put around my neck carried a sentimental value: a great flow of love and wishes from their side. I was very humbled to receive Tika from my own family-members for the first time. 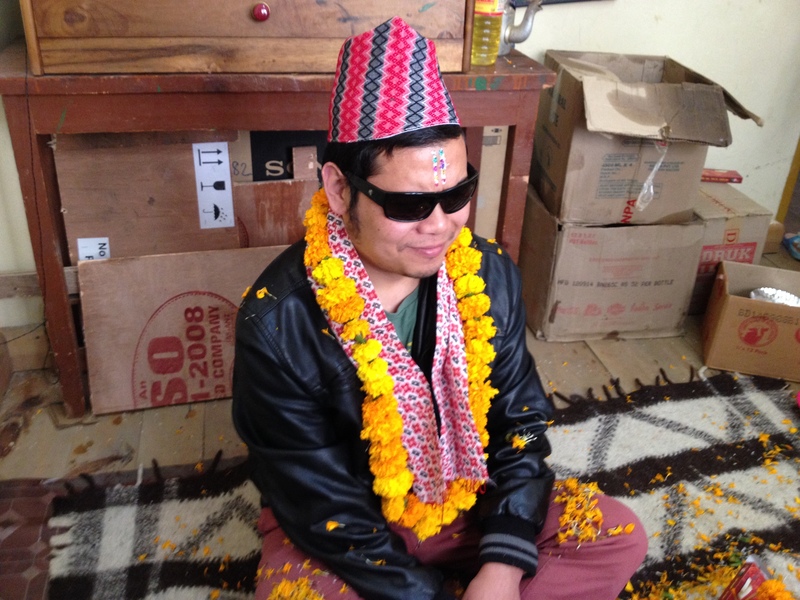 With 7-coloured Tika on the forehead and an aromatic flower garland around the neck, I had never felt so special before. Although I consider myself a Buddhist, I equally appreciate my original faith, Hinduism and today, I am proud of the unique blend of cultural values and traditions that give Bhutan a unique national identity. I am glad that this year’s Diwali has brought me closer to my own family, and I really feel that with today’s celebration, our family bond has grown stronger. From now onwards, I have my own family to go to during Dashain and Diwali every year in addition to the list of people on my wife’s side. I am very grateful to both my cousin sisters, brothers-in-law and their kids for their wonderful gifts and wishes. I would also like to wish all my friends and other relatives a very very happy Diwali 2014 and may you all live a prosperous life!